Do you ever received a drawing that use metric, but you are not familiar with that measurement unit? Or the other way around? You want to convert the drawing to your unit. How can you do that? Create a new drawing with your preferred unit, then insert/bind your drawing there. Using -DWGUNITS tool. (for AutoCAD 2009 or later, more comfortable for experienced users). Read on if you want to know other options you have. 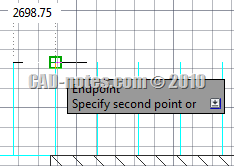 AutoCAD doesn’t treat the measurement as real measurement. Some other applications allows you to just change the units in option dialog, and the drawing will be adjusted automatically. But not AutoCAD. 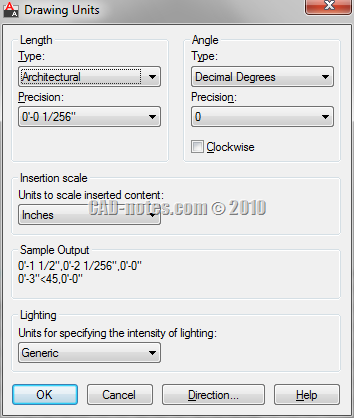 So how can we convert AutoCAD drawing units? The easiest way is by scaling all objects in our AutoCAD drawing. We know if we receive a drawing in mm, we can convert it to m by selecting all object, scale it by 0.001 (or 1/1000). To keep the drawing origin, we can use 0,0 as base point. We can convert from inch to mm by scaling all objects by 25.4. 110 were not in current space. Remember to change units after you scale your drawing. If you scale your drawing to cm, change units to cm. To change units, simply type UNITS then change the insertion unit. There is another way that we can do. 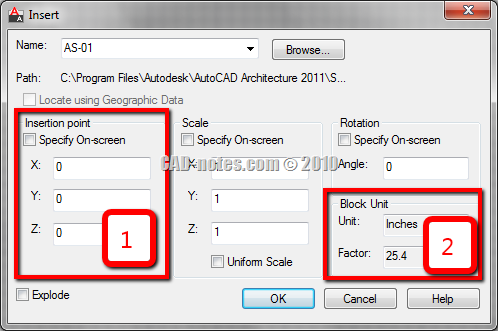 We can insert the drawing to another AutoCAD drawing, and let AutoCAD to convert the unit automatically. This method also allows you to work with multiple drawings that use different units. For example, you use metric for architectural design. The MEP guys need to use imperial because the MEP standard parts are not available in metric. Or you may receive block libraries that use imperial from the manufacturer, but you work with metric. This method allows you not only convert it, but also work with different drawing unit. Using imperial unit is painful for me. I want to convert it to metric. Let us check the drawing units. 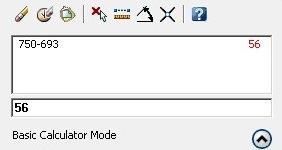 You can access it from AutoCAD menu> drawing utilities> units. We can see that the unit is already defined correctly. The insertion scale is set to inches. Now create a new AutoCAD drawing. Use one of the metric template available. 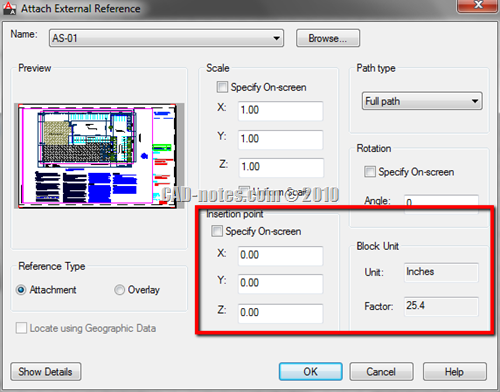 Check if the insertion scale in drawing units is set to mm. Activate insert block. First time you activate the dialog, the block unit should show unitless. Doesn’t matter. Browse for the file. After you click open and back to this dialog, you should see the block unit (2) now is showing inches. The conversion factor is now set to 25.4. 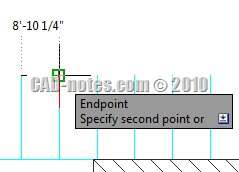 To make sure the drawing is still using it’s origin, use 0,0,0 as the block insertion point. Now because you are inserting the file as block, you may want to explode it. You can also use external reference (XREF) to do this. Now let us see if it works. Try to measure the same distance, and see what you get. This time I get the measurement in mm! It is an annoyance because it also affects annotation scale in layout/viewport so I would be very grateful if you could point me in right direction. I suspect it has something to do with your view, or you are drawing objects with elevation. Try to change UCS to World and type PLAN to reset the view. How did you scale the drawing? I would suggest you to modify the dimension style, change the text and arrow size to match the current scale.